Port team members welcomed in the spring season by getting out and volunteering at several events this March. 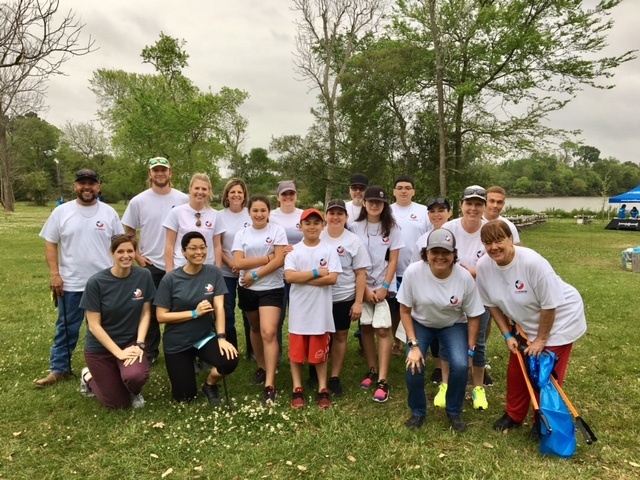 Employees participated with other community volunteers at the 25th consecutive annual Rivers, Lakes, Bays and Bayous' Trash Bash® event by cleaning up garbage and debris near Armand Bayou Nature Center and surrounding areas March 24. Trash Bash® hosts over a dozen cleanup sites all around the Houston region, making it the largest single-day waterway cleanup in the state of Texas. Thousands of Houstonians also visited Tidwell Park during Bayou Greenway Day March 24 for free activities, exhibits, food and music as a way to celebrate and experience the beauty of local greenways. Port Houston participated in this Houston Parks Board event by educating the community about the importance of keeping our bayous clean, since many of these local waterways eventually connect to the Houston Ship Channel. Other events in March included the port’s participation in the Pasadena Library Carnival, where team members shared information about the port’s free M/V Sam Houston Boat Tour. Port staff also took part in the Houston Yacht Club’s annual barbecue cook-off challenge, which provided a unique opportunity for Port Houston to engage club members and local community members in Galveston Bay. Lastly, several Port Houston team members from helped support More Than the Move’s “Houston vs. Hunger” event, which sought to package 100,000 meals for food banks in the Houston area during a one-day, two-location volunteer event. “Port Houston is dedicated to engaging and educating the local community, and to helping improve the quality of life of those in our region,” said Leslie Herbst, director of community relations and events.